Researchers at Vanderbilt University, the University of Texas Medical Branch at Galveston and The Scripps Research Institute for the first time have shown how human antibodies can neutralize the Marburg virus, a close cousin to Ebola. Their findings, published this week in two papers in the journal Cell, should speed development of the first effective treatment and vaccine against these often lethal viruses, said James Crowe Jr., M.D., whose team at Vanderbilt isolated and characterized the antibodies. 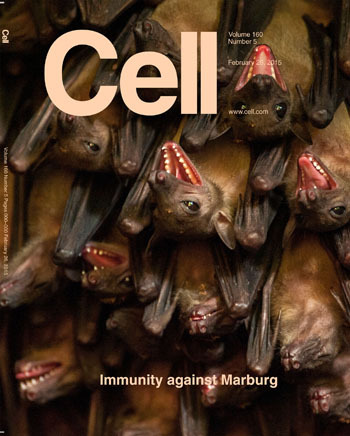 The study by Vanderbilt investigators describing how human antibodies can neutralize the Marburg virus is the featured article on the cover of the journal Cell. Fruit bats like these are known to harbor the virus. Some of the anti-Marburg antibodies also bound to Ebola Zaire, the viral strain responsible for the West African outbreak that since last spring has killed about 9,000 people and sickened more than 22,000, mainly in Guinea, Liberia and Sierra Leone. “The good news is, humans do make antibodies when they are infected that can kill these viruses … which suggests that vaccines should work,” said Crowe, Ann Scott Carell Professor and director of the Vanderbilt Vaccine Center. The search for the viral “Achilles’ heel” began three years ago, when Crowe read about an American tourist who was hospitalized in early 2008 with a life-threatening illness after returning to the United States from Uganda, where she had visited a fruit bat cave. She was later diagnosed with Marburg virus infection, the only known case in the United States. Fruit bats are known to harbor the virus. Crowe contacted the woman through her physician. From a sample of her blood, first author and graduate student Andrew Flyak and colleagues in Crowe’s lab used a high-efficiency method to isolate for the first time human antibodies that bound a protein on the surface of the Marburg virus. The ability of some of the antibodies to neutralize, or kill, Marburg virus was confirmed in the level 4 biosafety facility at UTMB’s Galveston National Laboratory. No live virus is used in the research at Vanderbilt. In a separate paper published in Cell, Erica Ollmann Saphire, Ph.D., and colleagues at The Scripps Research Institute in La Jolla, California, used X-ray crystallography methods to solve, for the first time, the structure of the Marburg virus bound to antibodies provided by the Crowe lab. “Since we know where on the virus important antibodies bind, that tells us what needs to be in the vaccine,” Crowe said. Vanderbilt is partnering with companies, including Mapp Biopharmaceutical Inc. in San Diego, to produce large quantities of Marburg and Ebola antibodies that could be used to provide short-term protection from infection, especially for health care workers and family members who may be exposed to the viruses. Ebola and Marburg are highly lethal in part because it takes the body’s immune system four to six weeks to mount an antibody response. Injecting antibodies prior to or in the first few days following exposure could prevent full-blown illness, he said. Crowe said he hoped clinical safety and dosage trials, some of which may be conducted at Vanderbilt, could be completed by the end of the year. Antibody treatments are expensive, however, in part because they must be repeated every three to four weeks. That’s why efforts are underway to develop a vaccine, which triggers the body’s own immune response lasting for years and in some cases a lifetime. The research was supported by the U.S. Department of Defense (Defense Threat Reduction Agency, grant number HDTRA1-13-1-0034), and by the National Institutes of Health (including grant numbers AI109711, AI109762 and AI089498).